DAC3L shares the same great build and engineering of the DAC3HGC but omits the headphone amplifier section so its purely a DAC. Earn 2095 loyalty points when you order this item. 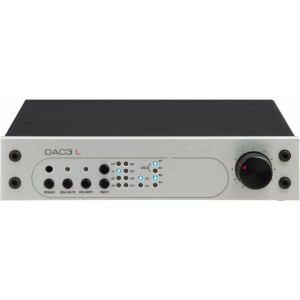 Benchmark DAC3L DAC is the latest D/A converter from Benchmark following on from the DAC1 and DAC2. It adheres to Benchmark’s brand philosophy of no-compromise, class-leading design, offering performance revered by professional recording studios and enjoyed by discerning audiophiles alike. The new DAC3 implements the ESS Technology ES9028PRO chip, achieving lower THD+N, 2nd and 3rd harmonic distortion compensation, improved power management, oversampling filters and, when combined with Benchmark’s UltraLock3 technology, near instantaneous input switching and phase locked loop, with undetectable jitter. The improvements don’t stop there though, with greater dynamic range and a wider frequency response, the specifications eclipse those of the DAC2. The DAC3 L model offers analogue preamplifier inputs but removes the dual headphone amplifier found in the HGC. The DAC3 DX, removes the analogue preamplifier section to accommodate an AES digital input but retains the dual headphone amplifier. The DAC3 delivers outstanding musical detail and precise stereo imaging. It employs an advanced high-headroom digital filter design, and a high-sample-rate Asynchronous USB Audio interface. All inputs are fully isolated from interface jitter by Benchmark's new UltraLock3 jitter attenuation system. Internal digital processing and conversion is 32-bits, and this processing includes 3.5 dB of headroom above 0 dBFS. This headroom prevents the DSP overloads that commonly occur in other D/A converters. Four balanced 32-bit D/A converters are summed together to create each balanced analogue output. This 4:1 summation provides a 6 dB noise reduction, and gives the DAC3 industry-leading performance. Any practical audio system will need a volume control and most audio devices use digital volume controls. These controls place significant demands on the quality of a D/A conversion. An internal D/A converter that starts with the equivalent of 14-bit performance may only deliver 12-bit performance at typical volume-control settings. Benchmark's unique hybrid volume-control system delivers maximum performance from analogue or digital inputs. A single motor-driven knob controls the volume of the analogue and digital inputs, but the two types of inputs are handled very differently; Digital inputs pass through a 32-bit digital volume control while analogue inputs pass through a traditional analogue volume control. Both still share the same knob. This hybrid approach eliminates all unnecessary A/D and D/A conversion steps. Analogue inputs see an entirely analogue path to the outputs. Likewise, digital inputs see an entirely digital path to the 32-bit D/A converter. The DAC3 includes the input selection, volume control, and output buffering functions of a traditional hi-fi "preamplifier". Like a traditional preamplifier, the DAC3 is specifically designed to drive power amplifiers, but the DAC3 carries this concept to perfection. The high-current output stage of the DAC3 can be programmed to match the input sensitivity of your power amplifier. This unique feature optimises the interface between the DAC and your power amplifier, giving you the highest-possible system performance. The DAC3 provides the cleanest, most direct path to your power amplifier. No additional "preamplifier" is required or recommended unless your system includes a turntable. If so, your phono preamplifier should be connected to one pair of analogue line-level inputs. In any system, the most transparent performance will always be achieved when the DAC3 is connected directly to a power amplifier.